Of the hundreds of competitors that turned up for the 2018 Pivot TwentyFour12, there seemed to be just as many different bikes. Singlespeeds, fat bikes, full suspension enduro bangers, retro rigs, clapped-out 26in bikes with v-brakes, lightweight carbon hardtails and high-end kids bikes all mixed together on the 10km race course over both the 12-hour and 24-hour categories. Though there were some very new and flashy high-end race bikes found at the point end of the field, it was the more worn out and well-used bikes that caught the attention of our cameras. Theses bikes were the ones that have had countless miles put into them over the years, built and setup for long-distance riding comfort and efficiency. The bikes that have been taken to places far and wide, and have owners with stories to tell. 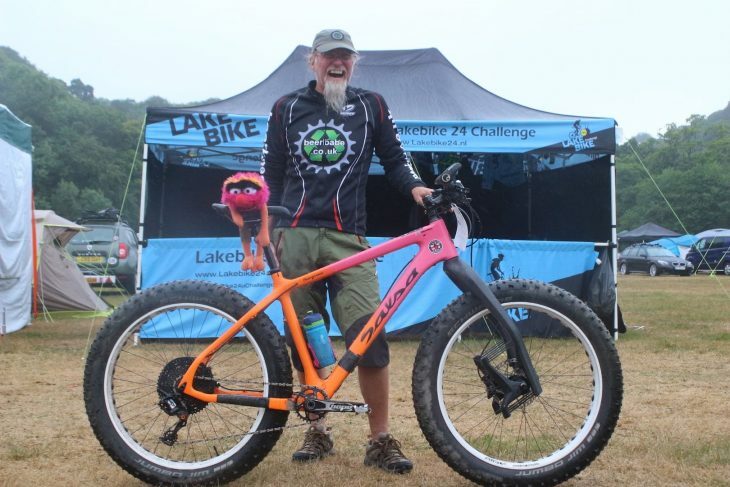 To give you a bit of a feel for the type of characters who came to the event, here are eight of those bikes and owners that we caught up with during the 2018 Pivot TwentyFour 12. Part-Brummy, part-Ozzie. The accent was quite the combination! A Brummy by heritage and a resident of Australia for the past 15-years (the accent is like NOTHING you’ve heard before! ), Martin had flown over to the UK for a 2-week holiday, which encompassed a long weekend spent darting around the race course at the TwentyFour12. 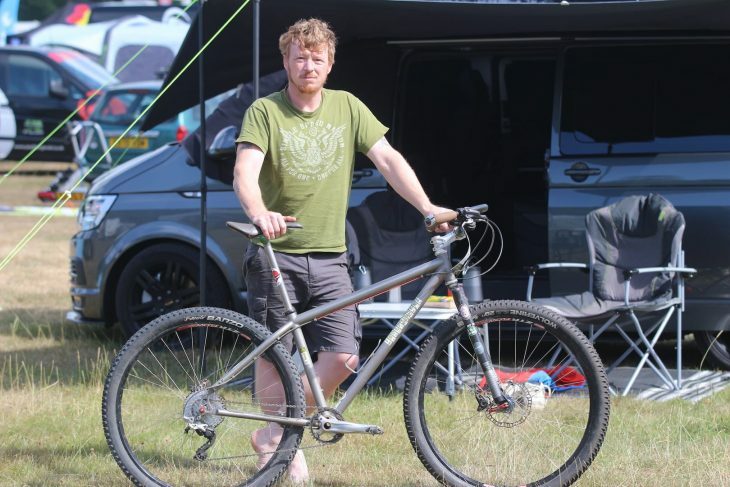 To tackle the full 24-hour category as a solo competitor like the madman he is, Martin had brought his titanium Sola made by Seven Cycles. This is actually the fourth frame Martin has owned, having broken the last three, which all cracked between the headtube and downtube. Thanks to the lifetime warranty on the frame though, he’s had a new one built for him each time. So he’s pretty much a sponsored rider by now. The fatigue might have something to do with the 20,000km that Martin puts on his bike each year, complete with rigid carbon fork too. This is Martin’s 4th Seven Sola frame. 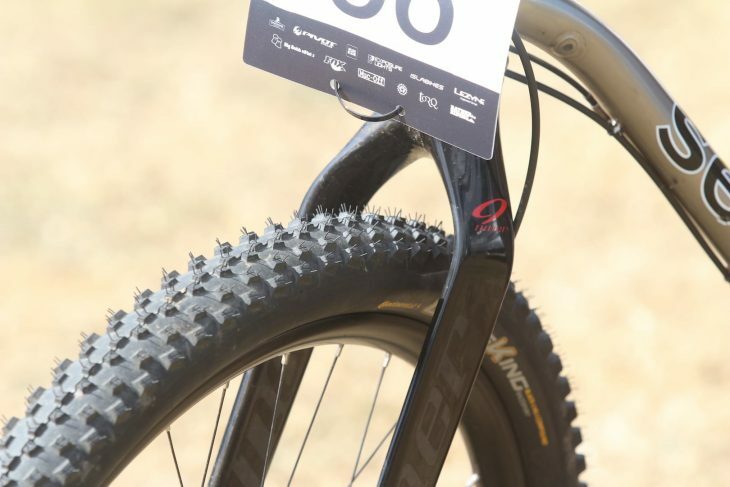 Carbon rigid fork from Niner, and fast-rolling Continental X-King tyres. 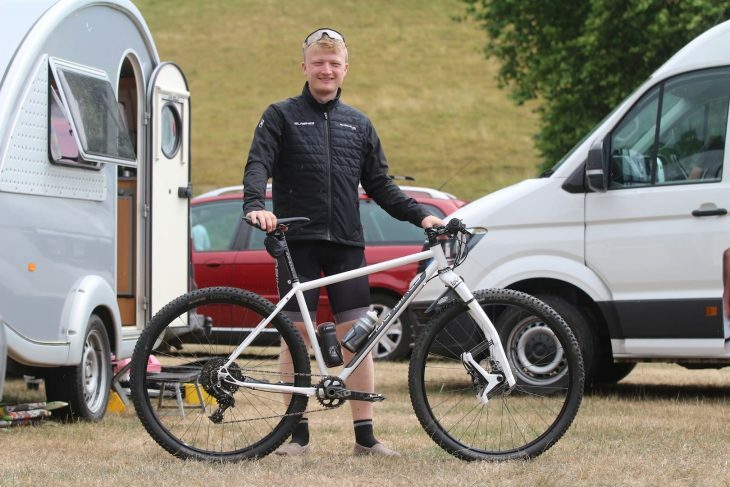 John brought his Indy Fab down from Shropshire to race the 12-hour solo. We spotted another titanium frame in the campsite, which belonged to another Brummy by the name of John. 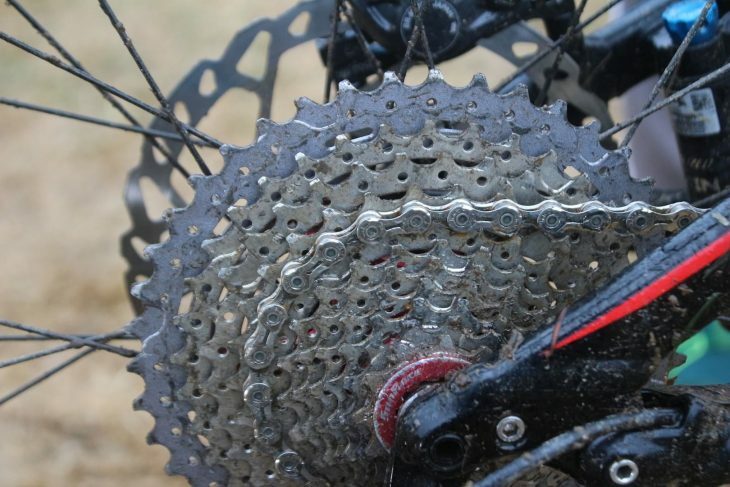 He’s had his Independent Fabrications titanium hardtail for over 10 years now, and apparently it was one of the first split-stay frames designed to accommodate a belt drive. 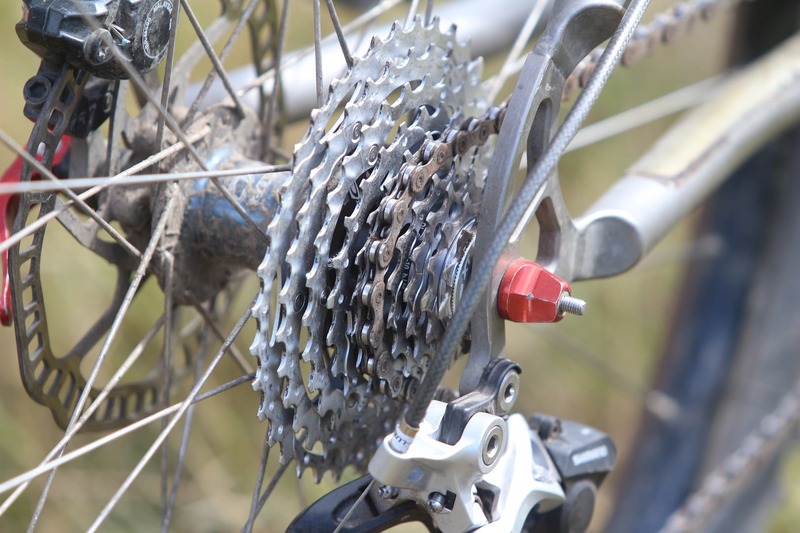 John has run it singlespeed with the belt drive in the past, but he’s busted a couple of belts, which he reckons is mostly because his mate (who works on the bike) isn’t actually a very good mechanic. So he’s since put on a regular chain with some gears. Setup with a nice and swoopy Jones handlebar with Ergon grips, this is a very comfortable looking bike with high-volume 29er tyres front and rear. John changes between running a suspension fork and a rigid fork, depending on the riding he’s doing. 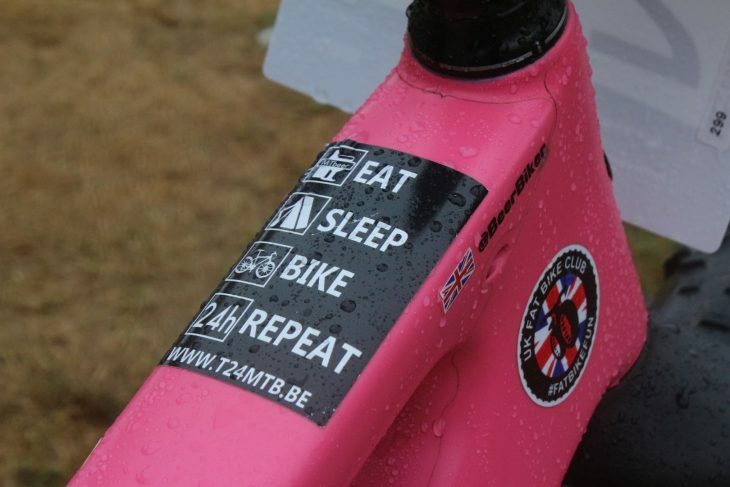 The bike gets used for a lot of overnight bivvies and long distance races, and it’s got the stickers and wear marks to prove it. 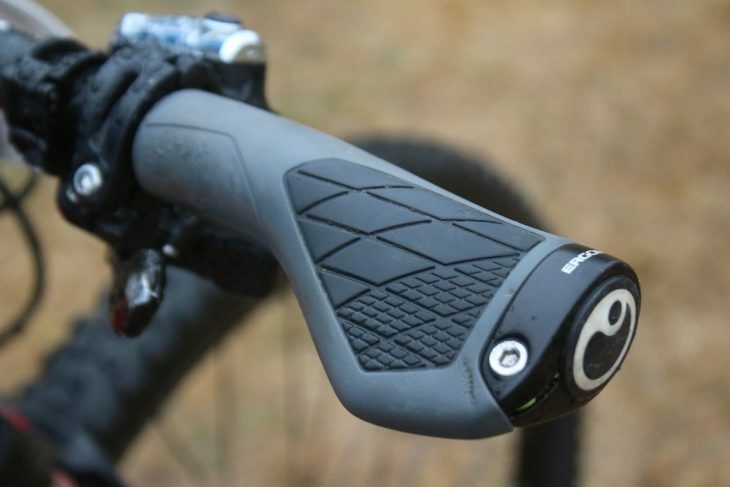 Swoopy Jones bars and flared Ergon grips for precious long-distance riding comfort. 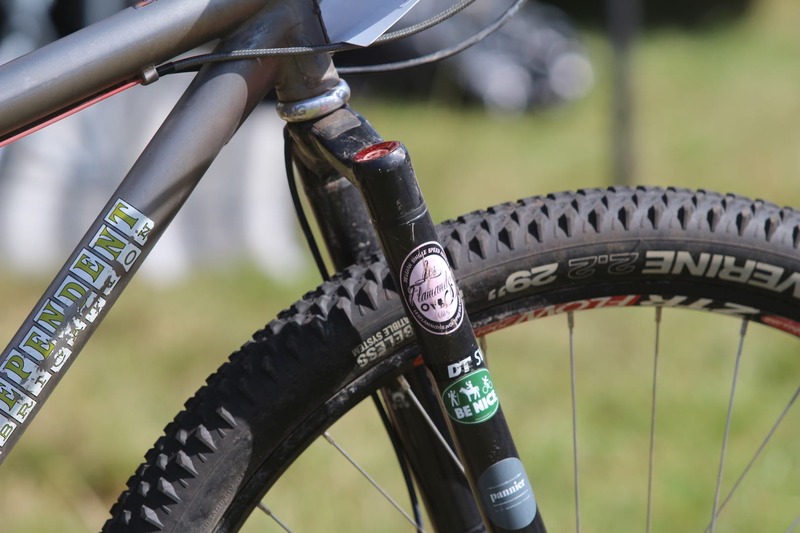 Those carbon DT forks have had some quality sticker work, and likely some tales to tell. No Super Boost Plus hub spacing or 13-speed drivetrains here. John & Richard share an appreciation for cocktails, singlespeeding and long distance mountain bike events. John’s riding mate, Richard, was also down to race the 12-hour category at the TwentyFour12. 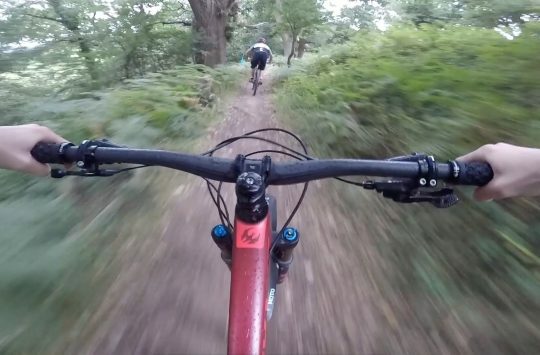 The pair ride regularly and also compete in singlespeed national events all over Europe. 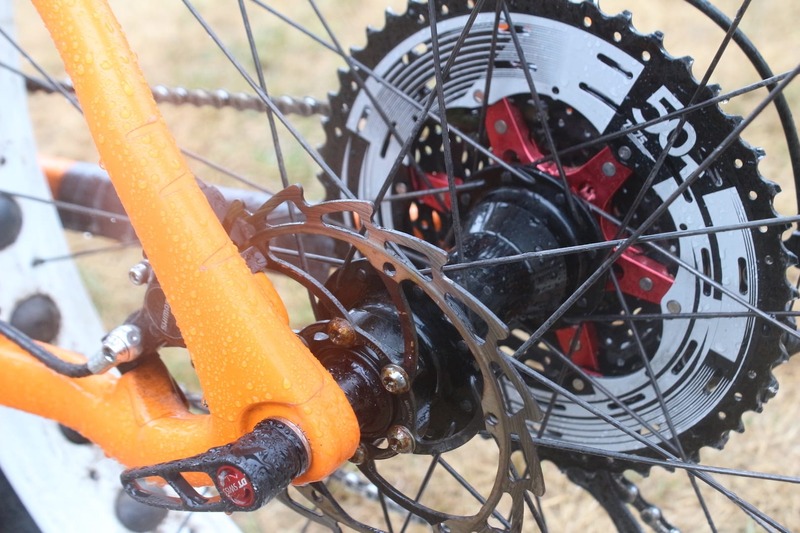 Instead of his Niner AIR 9 singlespeed race bike though, Richard decided to bring the geared bike for the weekend though, which is his 9:ZERO:7 fat bike that he custom built with a 14-speed Rohloff hub. 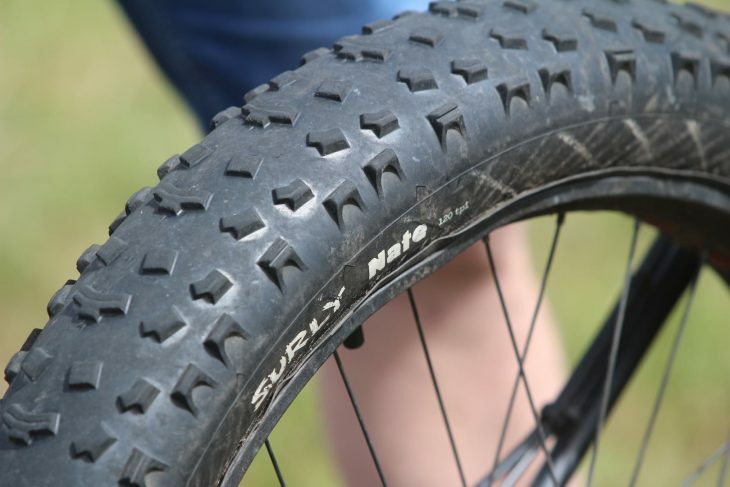 The Surly Nate tyres have been setup with a ghetto tubeless method, with a 2.4in moto inner tube that’s split down the middle and then wrapped over the rim to seal it airtight, and that allows Richard to run between 6-8psi of pressure in those fat tyres. Richard told us the bike was pretty heavy, but that he doesn’t mind because he rides for fun and not to be super competitive. We asked John & Richard what their nutrition plan was for the weekend, and it turns out that their racing strategy mostly involves cocktails. 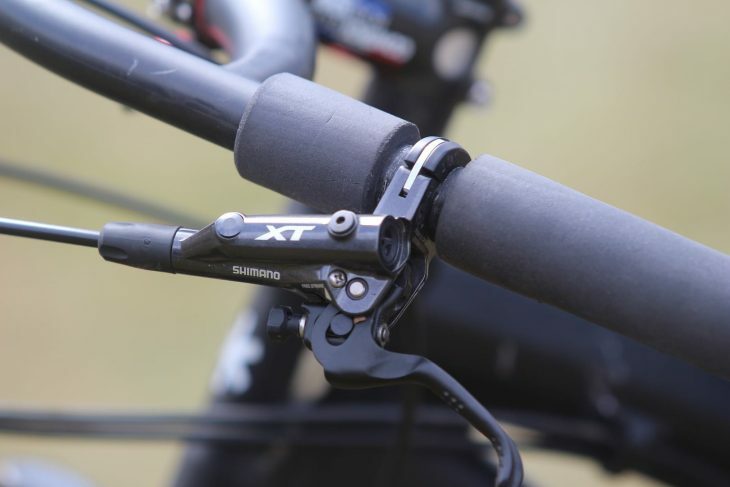 Nice addition of an ESI Chunky grip on the inside of the brake lever to provide another hand position. Richard isn’t quite sure how much longer he’ll get out of that chainring and chain. We’d say ‘not much’. 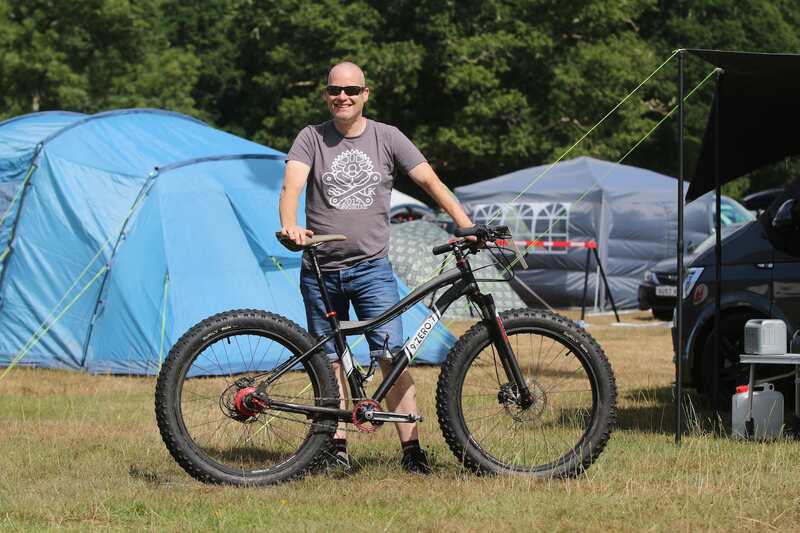 Despite being an avid singlespeed enthusiast, Richard says the 14-speed Rohloff is his favourite feature about his fat bike. 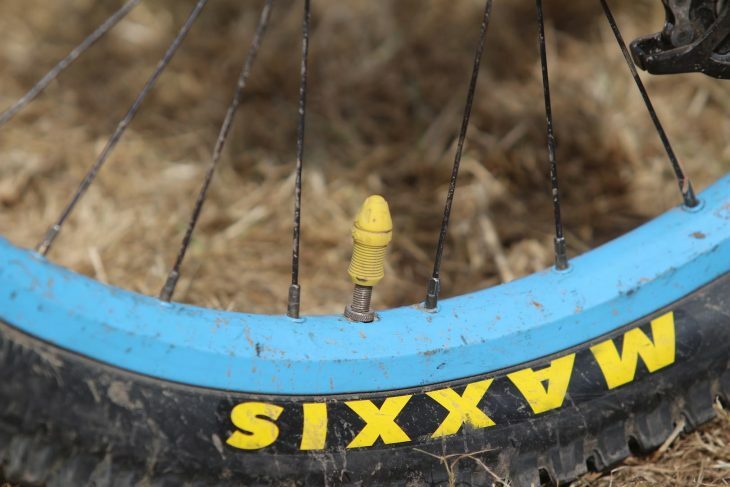 Spot the ghetto tubeless inner tube between the rim and the tyre? Andrew actually bought this bike second hand. Specifically with the blue and pink paint job. Without doubt the most *ahem* colourful bike at the Pivot TwentyFour12, this custom-built Orange Five belongs to a young chap named Andrew. He bought the bike second hand about 4-years ago, complete with the blue mainframe, pink swingarm, and mis-matched rims. 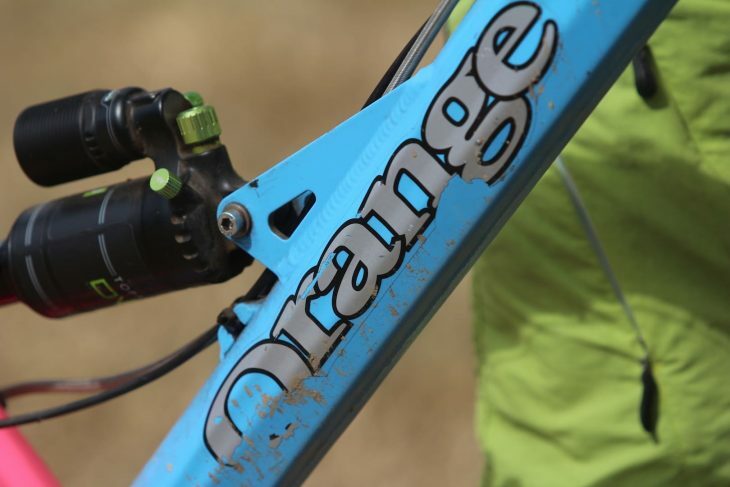 He’s made a couple of changes to it since then, including an upgrade to a DVO Topaz rear shock, and some DMR Deathgrips – orange on the right and blue on the left of course. Either Andrew has some replacement grips in waiting for when these wear out, or he found his kindred spirit on an internet forum where they were able to exchange coloured grips. Another Orange with a few stories to tell. 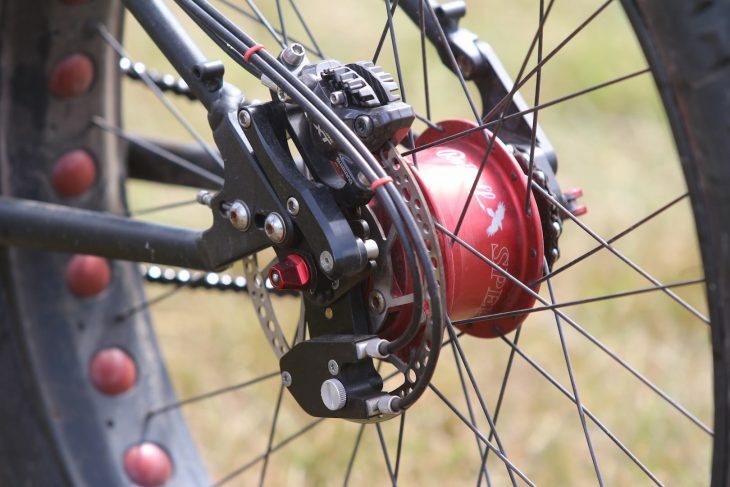 If in doubt, always go with pink brake rotors. 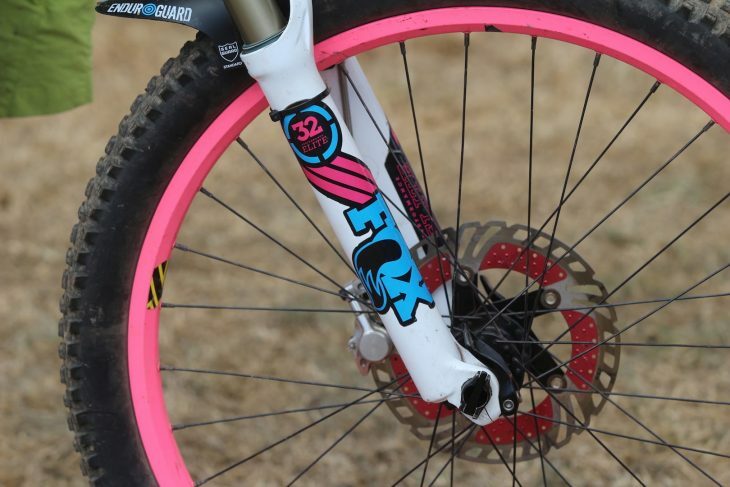 We particularly like the custom ’32’ sticker used for the 160mm travel Fox 36 fork. Keeps ’em guessing. 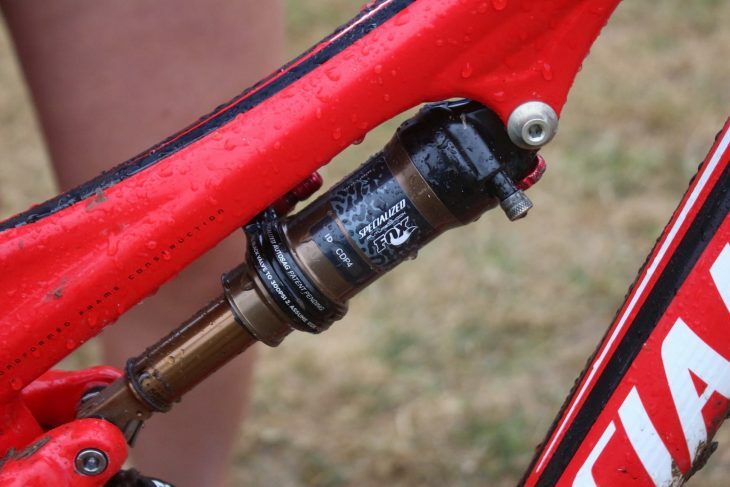 For that little extra dash of colour, Andrew has put one of Peaty’s Dee Dars on each valve. 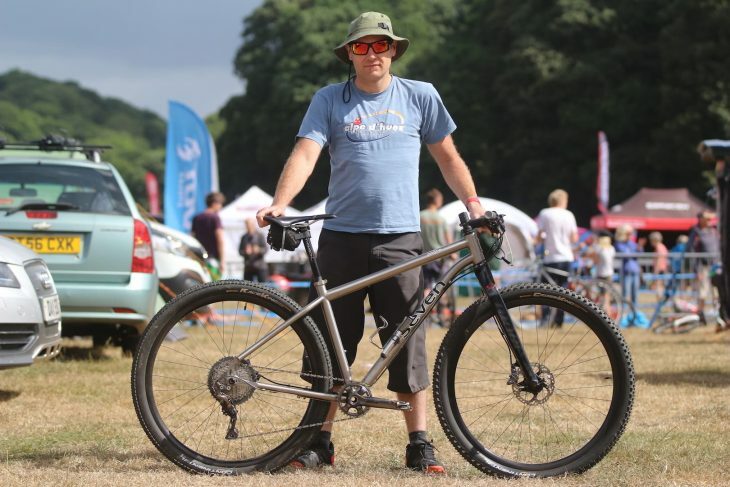 Jack from Islabikes was racing this custom steel 29in hardtail, which is handbuilt in Islabikes own factory in Ludlow. 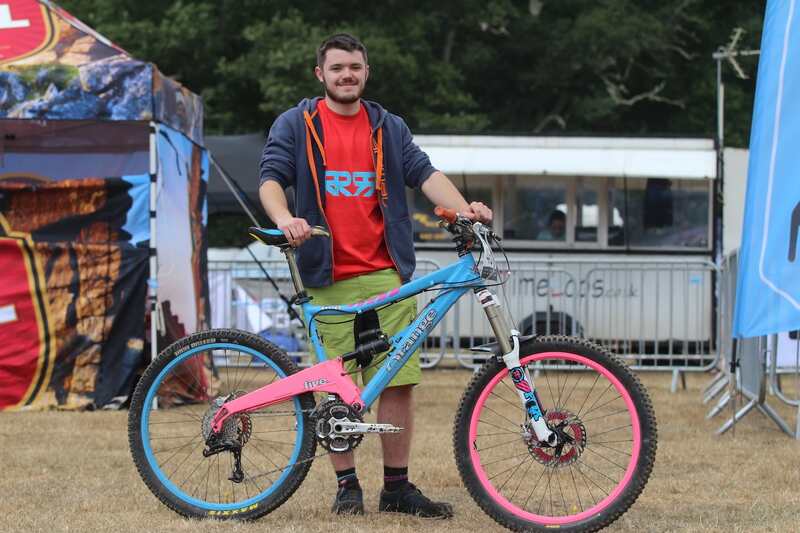 While chatting with Isla Rowntree and the Islabikes team, we caught a look at this custom-built hardtail that Jack was racing in the 5-person mixed team category. 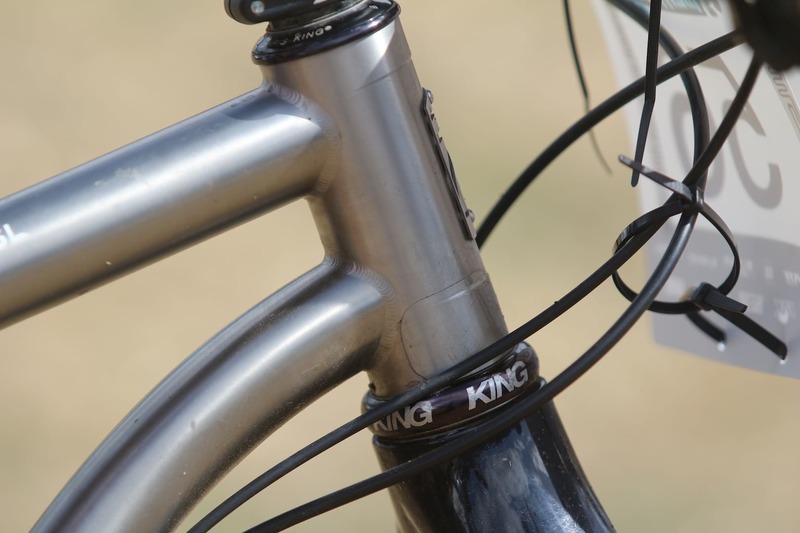 The frame itself is made from Reynolds 853 steel tubing for the front end, with 4130 chromoly stays for the back end. Islabikes actually has its own fabrication workshop at its Ludlow factory, where prototypes are made in-house. As well as prototyping new kids bike models, as a perk of the job, staff members can have their very own frame made in-house to their specifications. 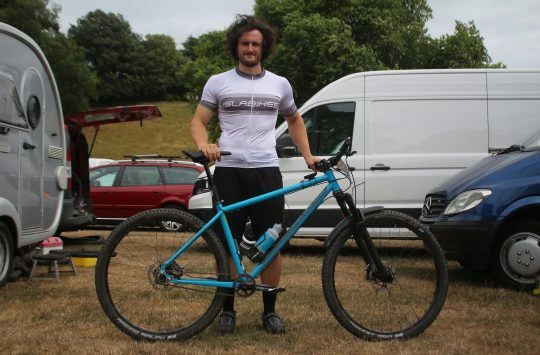 Jack’s bike is built as a 29er hardtail with the ability to fit 27.5+ wheels for bikepacking when the need arises. Though it can fit other forks too, right now it’s got that distinctive Lauf Trail Racer strut. 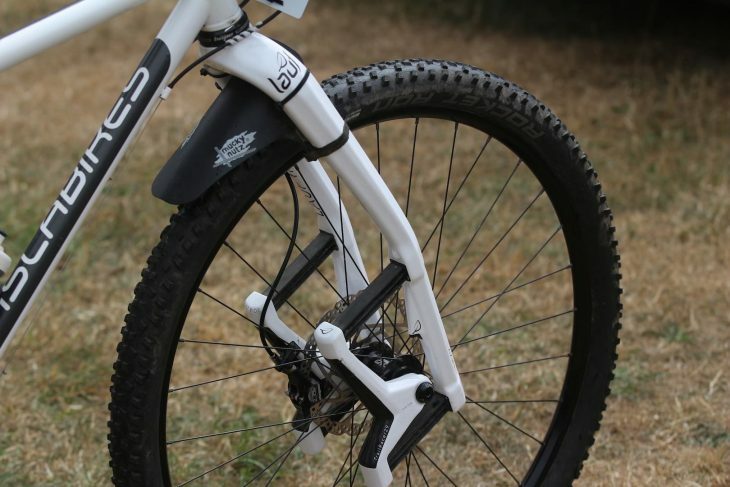 The Lauf forks are proving popular amongst fat bike riders, bikepackers and other people who hate normal suspension. Beargrease & The Beer Biker. Good band name that. A familiar face at the Pivot TwentyFour12 and at various endurance events both in the UK and further abroad, Roy is the ‘Beer Biker’ to the ‘Beer Babe’ of beerbabe.co.uk fame. 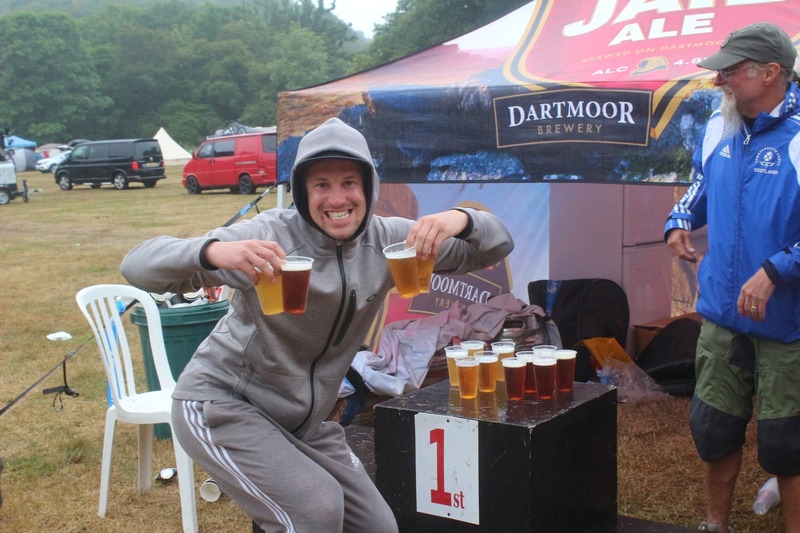 As well as pouring Dartmoor Brewery beers throughout the weekend, Roy also had a fabulous Salsa Beargrease that he brought to the event. Having purchased the Beargrease carbon frame two years ago at a discounted price (apparently the colour was a little ‘divisive’ amongst potential customers), he then set about building it up with Surly Rolling Darryl rims, Schwalbe Jumbo Jim tyres and a wide range 1×11 drivetrain. The first ride for the bike was at last year’s Battle On The Beach, and the bike has since travelled to France, Belgium and the Netherlands. 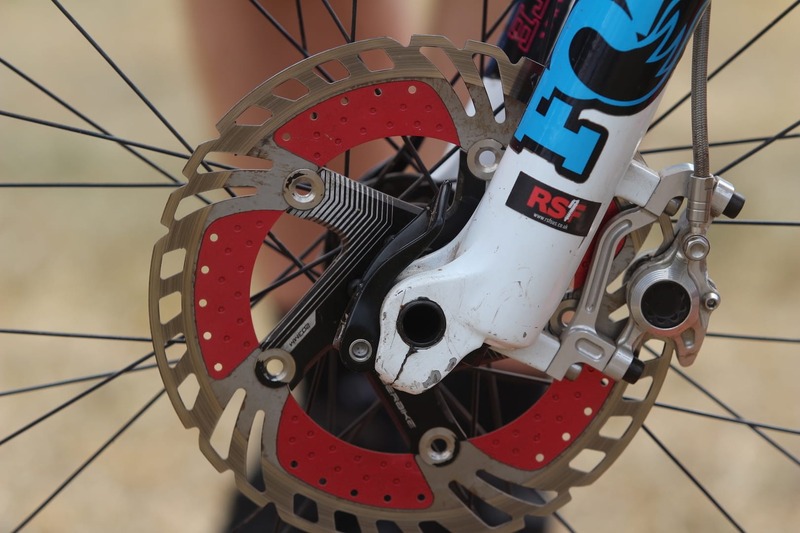 Since first building it, he’s added the Lauf Carbonara fork to give a little more comfort up front for riding 12/14-hour races and marathon events. Ergon grips and bar ends were everywhere at the Pivot TwentyFour12 – these are a popular choice amongst endurance and marathon racers. 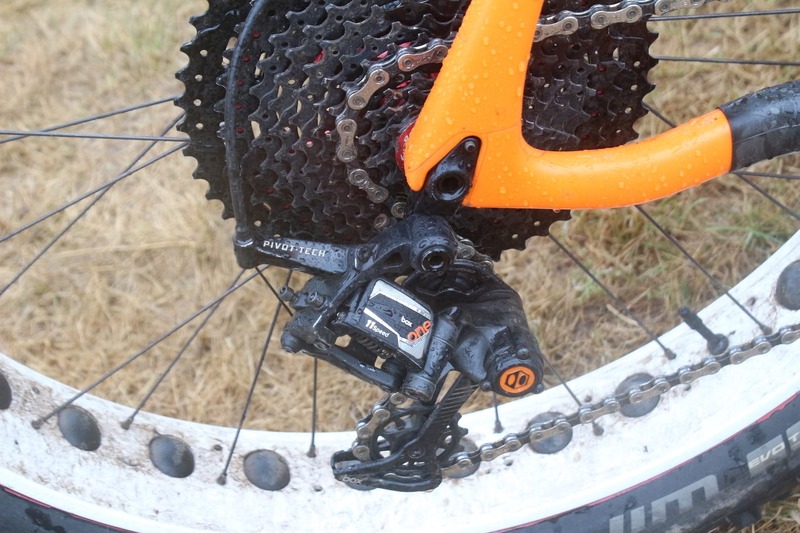 Roy is running a Box Components 1×11 drivetrain on his Beargrease. 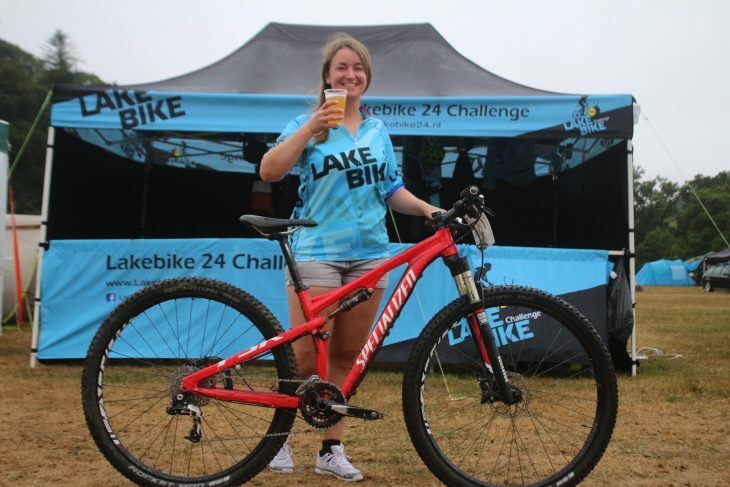 Jolien had a smile on her face for the entire weekend – good vibes only! Jolien was one from the Dutch contingent that had travelled over to the UK especially for the Pivot TwentyFour12. 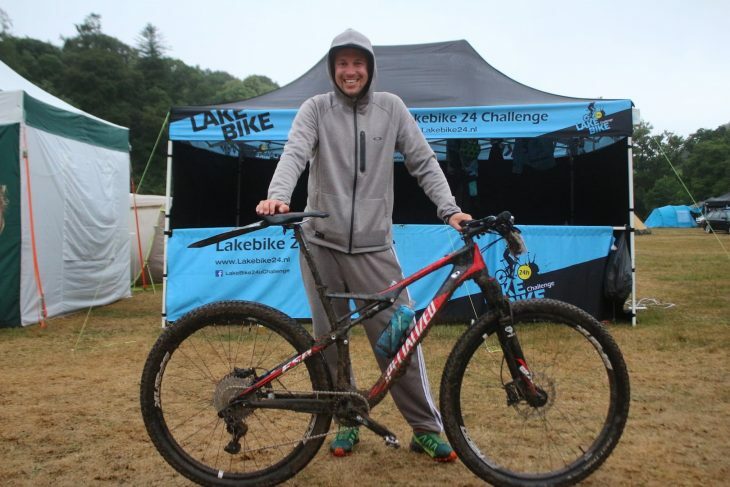 These guys run a 24-hour mountain bike event in June in the Netherlands called the Lakebike 24 Challenge. That’s where they first met the Beer Biker and Beer Babe, who convinced them to come over to the UK to be a part of the TwentyFour12. Jolien did her first TwentyFour12 last year, and despite the apocalyptic conditions, had so much fun that she and her riding mates decided to come back again this year. 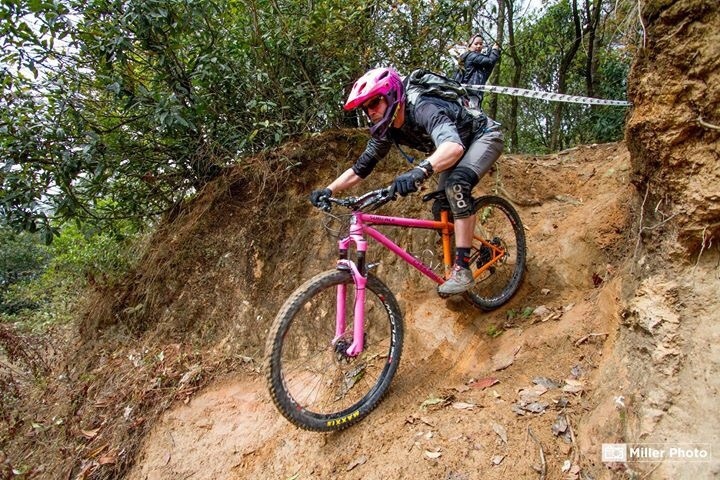 Always with a smile on her face, Jolien loved riding the singletrack around Newnham Park aboard her trusty Specialized Epic that she bought second hand two years ago. It was and still is her first proper mountain bike, though after a slew of endurance events and fair bit of wear and tear, she’ll on the lookout for a new race bike in the not-too-distant future. 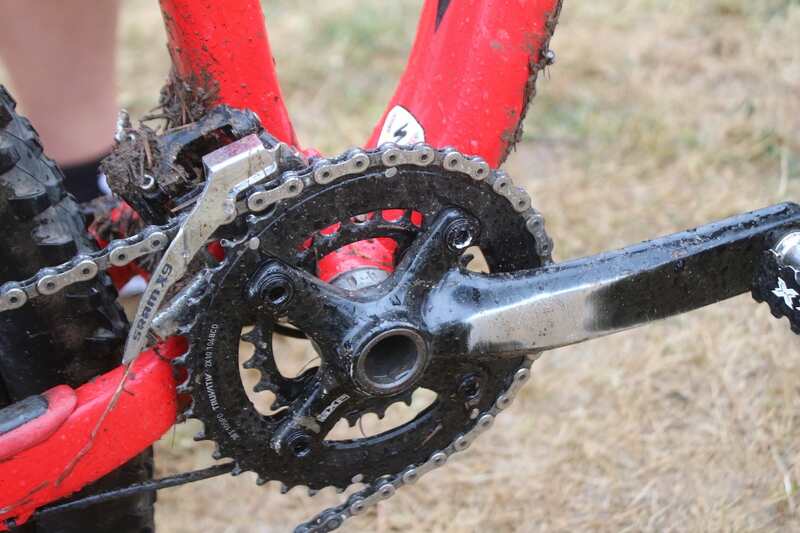 That little chainring came in handy on the Mach Attack climb. 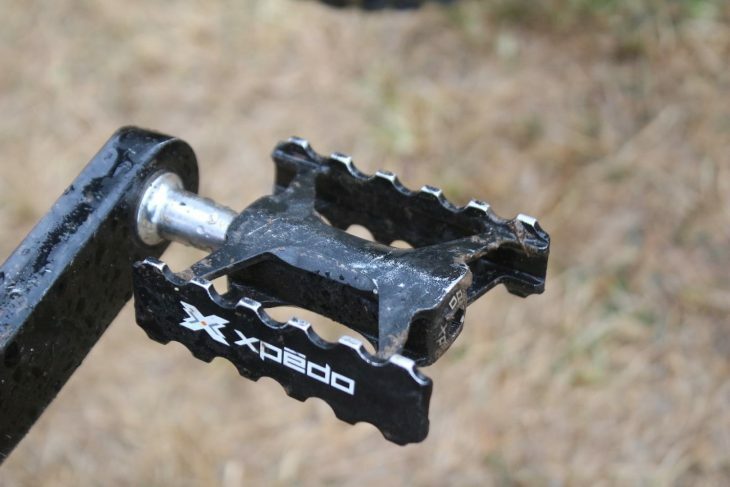 Jolien rides with these tiny alloy flat pedals from Xpedo. Being Dutch, her English is impeccable, and she had a right old giggle when we explained what the name sounds like. Plenty of travel being used via the Fox Brain shock. 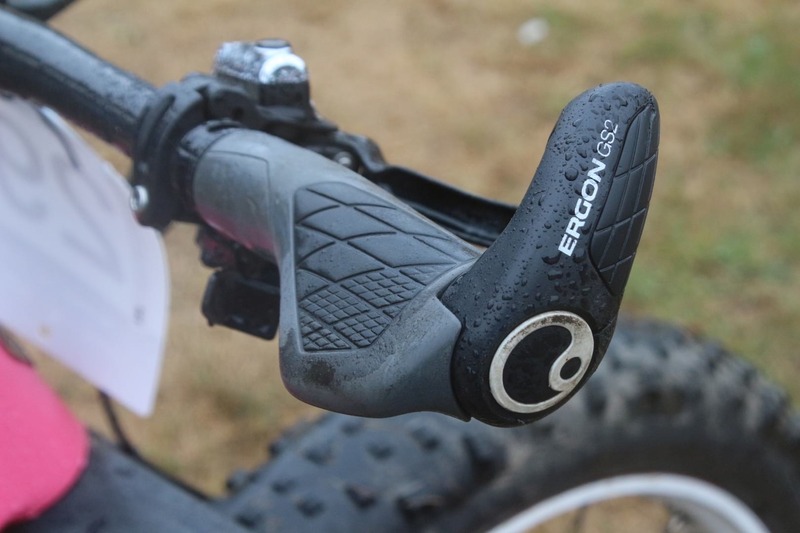 More Ergon grips! This article is not sponsored by Ergon BTW. Even with the rain and lack of sleep, Martin couldn’t help but give us a greasy smile for the camera. Another rider from Team Netherlands, Martin also had a smile fixed permanently on his dial for the entire weekend. He’s on a previous generation Specialized Epic (not the new one), which he has raced at numerous solo 24-hour races over the past four years. He loves the Brain suspension both on the rear and on the fork, as well as the soft Lizard Skins stick-on grips. 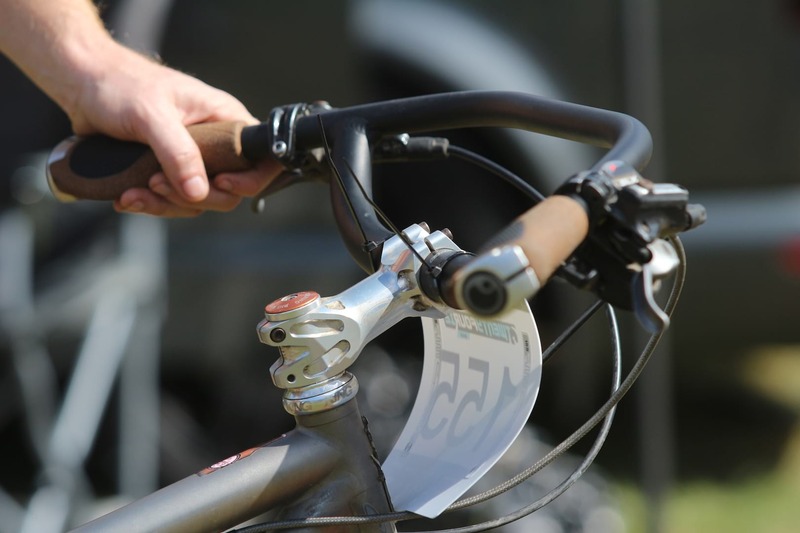 The rear mudguard was a specially purchased add-on from the Rather be Riding stand about halfway through the race. 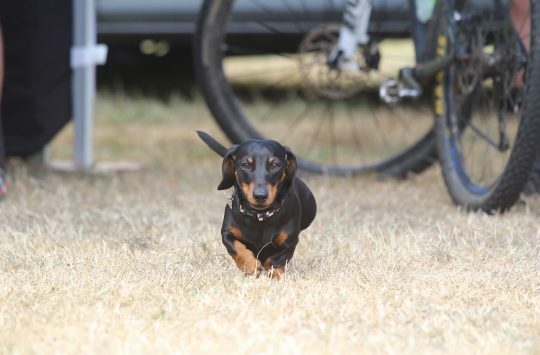 Martin was racing the full 24-hour race as a pair with his team mate Jasper, but the two ended up pulling the pin at around 3am after the rain started to lay waste to the previously dry and dusty race course. They still had a brilliant time at the event, and they’ll spend their last day in the UK at a pub drinking as much English ale as they can, before they get the chunnel back to Holland tomorrow. 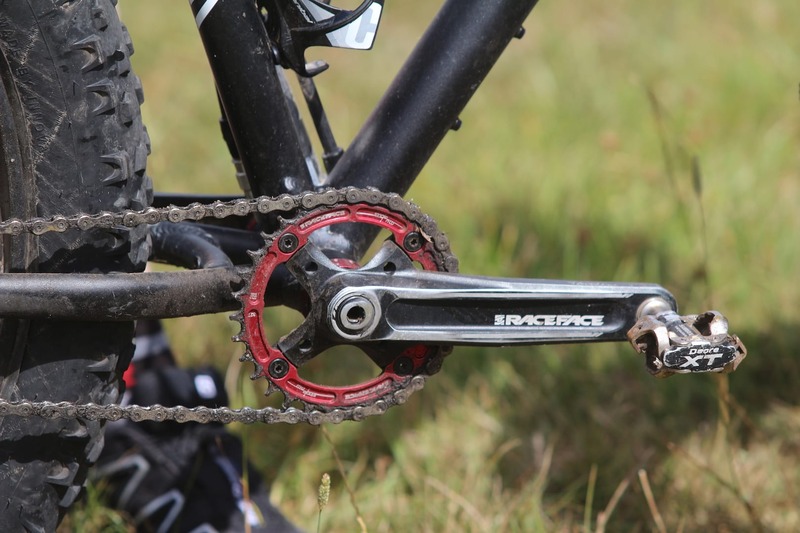 SunRace 11-speed cassette mated up to a SRAM GX drivetrain. 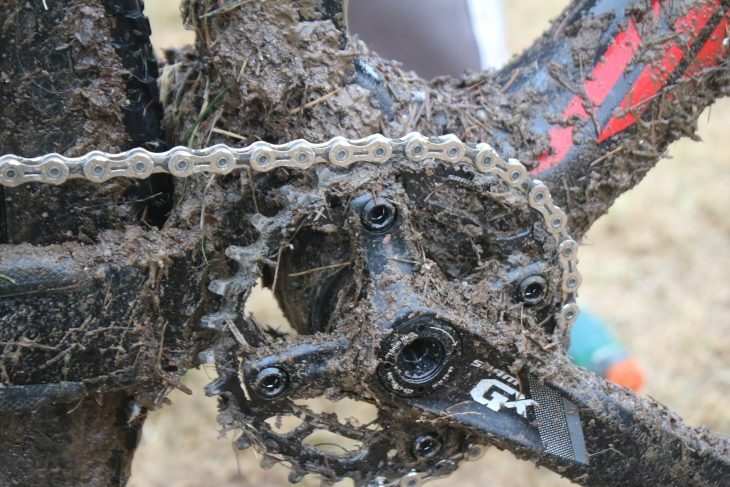 Just a little bit of mud. And time to celebrate Dutch style!